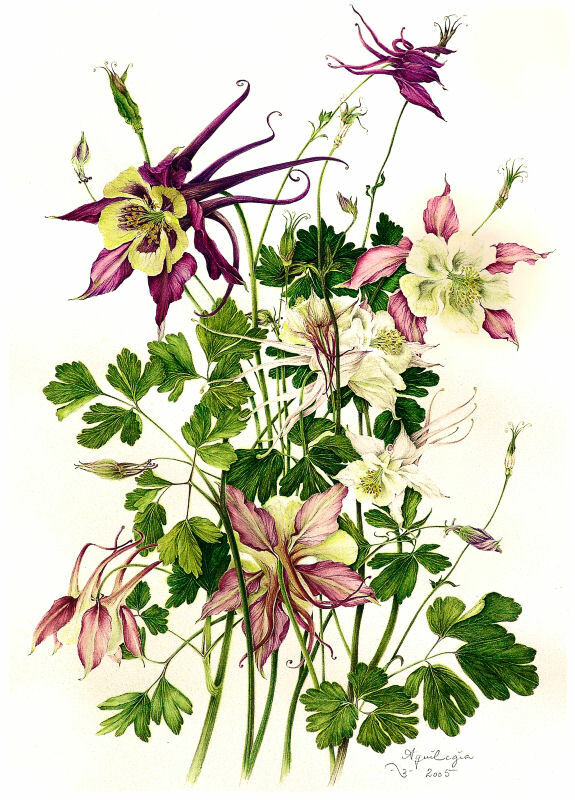 Various explanations exist for the Latin name of the columbine. The distinctive spurs of the flower are reminiscent of an eagle’s talons; the elongated petals, shaped like a goblet, resemble water collectors; they also suggest five doves encircling a water fountain. Clearly to an attentive observor this dainty yet complex flower calls to mind strange images. A hardy perennial, it is the state flower of Colorado, but is found from Nova Scotia to Texas and Florida, surviving in a variety of terrains, soil and climes, reflecting a persistent tenacity despite its delicate blooms. It favors the mild softness of spring, wilting easily in intense heat. Wild columbines show a brilliant reddish orange and yellow combination, but cultivated varieties come in an assortment of dazzling colors. 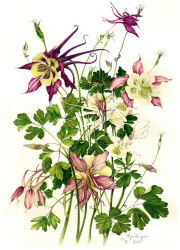 Next time you encounter a columbine, whether in a garden or on a ramble, stop a while and look at it closely, slowly. You will notice five flat sepals surrounding a set of five tubular petals, shaped like chalices narrowing into elongated nectar spurs which curl whimsically. This makes nectar collection virtually impossible for bumbling bees, leaving the feast to hummingbirds and hawk moths. When the bloom fades and the petals drop, a delightful seed pod emerges, with five distinct ridges and stamens still attached to the tip, like feathers on a miniature, exotic turban! Native people used infusions from different parts of the plant as remedies for a variety of complaints — heart trouble, fevers, poison ivy — to name a few. They also used pulverized seeds to apply as an unguent. It served as a love potion or else a perfume. Whether or not the charm works, columbines certainly charm the eye and delight the heart!